Plan of the Battle of Brooklyn August 27th, 1776. An extremely attractive decorative plan of Brooklyn, New York drawn in 1867 by Samuel Edward Stiles. 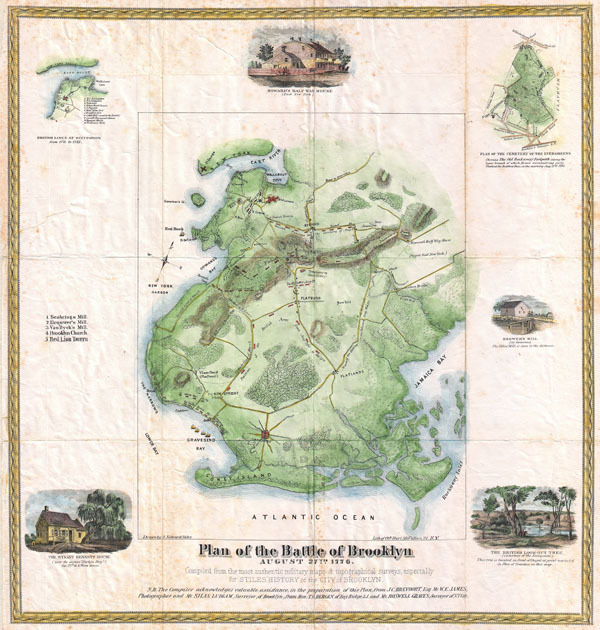 Designed for Stiles' important History of Brooklyn, this rare map attempted to illustrate August 27th, 1776 Revolutionary War Battle of Brooklyn. This was the first major battle in the American Revolutionary War and predicated the British Capture of New York City. Color coded to show troop movements, forts, and roadways. Surrounded by six decorative vignettes including an inset of the 'British Lanes of Occupation form 1776 to 1783,' Howard's Half Way House, a Plan of the Cemetery of the Evergreens, Brower's Mill ( at Gowanns), the British Lookout Tree in Evergreen Cemetery, and the Wynant Bennet House (23rd Street and Third Ave). Drawn by Edward Stiles and engraved by Charles Hart of 99 Fulton Street, New York. Stiles, S. E., History of the City of Brooklyn, Vol 1, page 250. Very good condition. Original folds. Light foxing and light overall toning. Bulletin of the New York Public Library, vol. 4, 1902, Page 85.